Miley Cyrus | Block That! …A moment of self indulgence. Not Mindless Self Indulgence…Just regular self indulgence. My name is Warren Piece and I believe in fitness. I love the motivational fitness Facebook pages. I really do. I love the twinges and tingles it gives me to read then and check out the pics during the day and rageface at night when I get home. I’m at a point in my life where I have time. Time is something I never had a lot of. At the moment, in the evenings I have time. I am going to make the best use of it and really take my level of fitness to the next level. I’m going to be the strongest I’ve ever been, the fastest and the healthiest. I am doing it for me. But, I’m also doing it to create a relate-able sequence of events that I can use to motivate people. To go from a clearly established starting point and progress to a point; not even visible from that starting point. I’m already in pretty good shape – I can bang out a 30 pull-up set, run 3 miles in 20 min and one rep bench 1.5x my body weight. But, the beauty of still being alive is that if you’re willing to put in the work, you can always be better. So long as we’re sucking air…we have the option to keep fighting. I think the gym is a sanctuary. It’s a place where you can confront your weakest self, and find your strongest self. The weight doesn’t move itself. You move it. Muscles don’t grow on their own. You flex and build them. With enough determination you can lift any weight. Today they ask why, later they’ll ask how. A year from now you’ll wish you’d started today. Just a couple of words of encouragement. Be the best you, today. Don’t Stop. We need you now more than ever. I’m following the presidential elections in Afghanistan with almost more interest than our own upcoming election. Whoever gets elected almost single-handedly has the power to validate the Coalition’s accomplishments here or rewind Afghanistan back to the stone age, which a friend of mine eloquently stated would only set them back about two weeks. Karzai is chomping at the bit to welcome the Taliban back into the government based on them being Afghans and thinking for some reason, they will have any respect for the Afghan government and toss aside their traditional ways. Which, in the past has not ever been an option for them. Sayyaf; the grandfather of Al’Qaeda is running for president. I found this article and wanted to share it with you. I feel like he did what he needed to do at the time…and he might be the best hope for Afghanistan. Abdul Rab Rasool Sayyaf is a controversial Afghan politician, a former member of parliament, and now a presidential hopeful for the country’s 2014 election. To his supporters, he is a leader who took on the Soviets and played a key role in the jihad against the Afghan communists. To his critics, he is a warlord who led bloody battles on the streets of Kabul, killing thousands of Shiites and Hazaras during the 1990s. To Westerners, he’s an extremist with links to al-Qaeda-minded people, whose name alone has inspired other Islamist groups as far away as the Philippines. And now, for the Taliban in Afghanistan, he has become “Public Enemy No.1,” someone they have already declared a dead man. Sayyaf, which means “the swordsman” in Arabic, does not venture out of his sprawling residence west of Kabul very often, and he has kept a relatively low profile in the parliament over the last decade. But his role in the violent and often unpredictable Afghan political world extends beyond the country’s “House of People.” He is known to have played a key role in the appointments of governors and district governors across the country. He runs his own university and TV station in Kabul. He is wealthy, media-shy, and a shrewd behind-the-scenes political operator. But over the past few years, he’s taken on a subject that is critical for the survival of the Taliban and other violent extremists — their own religious narrative to inspire, recruit, and justify violence in the name of God — making him their new arch nemesis. Then last week, during an Afghan government-sponsored International Islamic Scholars conference in Kabul, Sayyaf again spoke against the Taliban, this time targeting the militants’ financial backers in Middle Eastern countries. This is because the Taliban and the Haqqani Network, their chief ally, are known to do fundraising in the Middle East, especially in the Gulf Arab states. Sayyaf knows this well because he himself used to travel to Arab countries in the 1980s, using his oratory skills and knowledge of Arabic, to raise funds for mujahideen fighting the former Soviet Union. The Taliban and their violent extremist allies responded immediately to Sayyaf’s remarks. In one article titled “What does this old Dajjal (anti-Christ) say?,” they attacked Sayyaf, calling him a “manifestation of Satan,” and used Quranic texts in an attempt to counter his remarks. Zabihullah Mujahid, a Taliban spokesman, also tweeted articles, social media posts, and reports from the militant group’s own gathering of “1600 undisputed Islamic scholars” and their fatwa to discredit Sayyaf and the government-sponsored Islamic Scholars conference. The primary reason that the Taliban militants view Sayyaf’s remarks, and condemnations by the international Islamic scholars, as an existential threat to their survival is simple. For almost a decade, the Taliban have relied on skewing the interpretation of Islam’s religious texts to justify their violence, especially the use of suicide bombing, which had no precedence in Afghanistan until the mid-2000s. But while Afghans abhor the use of suicide bombings, despite extensive propaganda campaigns by the Taliban to justify it on religious grounds, Afghanistan’s religious scholars have yet to strongly and consistently counter the militant group’s religious justifications for violence — until now. Since Sayyaf’s “challenge” to the Taliban’s religious narrative, the militant group appears to have found itself outgunned in the battle for ideology, something which is far more important to them than winning a military campaign. This is because Sayyaf has established religious credentials from Sunni Islam’s most prestigious school, the Cairo-based Al-Azhar University, which allows him to speak with authority on religious issues. He is also a charismatic and gifted orator, which brings him coverage in the local media, and he maintains political influence through his traditional networks in some key northern provinces of Afghanistan, as well as in some of the former Taliban heartlands in the south, which adds to his leverage. Because of this, the Taliban want Sayyaf dead — in fact, Afghanistan’s intelligence agency recently announced that it had foiled a Taliban plot to assassinate Sayyaf only days after his speech in early September of this year. Sayyaf is not a saint to Afghans. Nor is he considered a moderate Islamist. His involvement in human rights abuses, especially during the Afghan civil war in the 1990s, is well documented by Human Rights Watch. Yet his current stance, effectively challenging the Taliban on their own ideological and religious turf, is something significant for both the international stakeholders who are attempting to end the war in Afghanistan, and for regional Islamic countries that are searching for ways to rescue the peaceful message of Islam from the dark interpretation espoused by violent extremists. After all, the Taliban and other militant groups are expected to step up their terror campaign inside Afghanistan after the withdrawal of international troops at the end of 2014. To do so, they need their religious narrative to hold, enabling them to bring in new recruits to maintain their ranks and sustain their violence. Sayyaf, despite his own violent past and infamy, appears to be taking the lead in challenging this narrative, making him “Public Enemy No.1” to the Taliban and other extremists in Afghanistan and beyond. I appreciate the marvels of modern technology and use them daily – Texting, Emailing, Interwebbing, this Blog and listening to Podcasts. I can’t believe this is even happening. Is that naive of me? 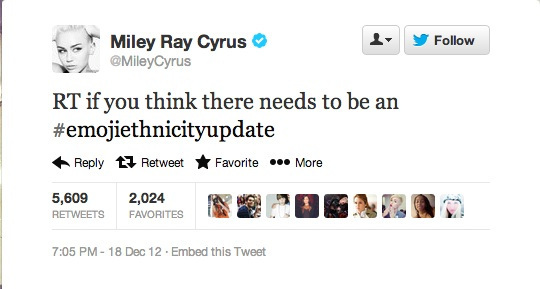 Miley Cyrus is tweeting about Emoji equality. Apparently, Emoji’s are little faces of people on the iPhone use to brighten text messages and transmit face codes. I’m an android guy, so I don’t really care about iPhone problems. 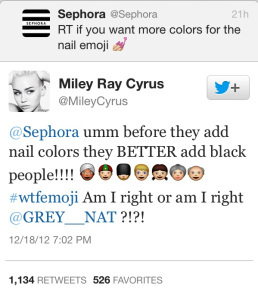 Miley does, though, she’s all amped up about how the Emoji’s aren’t ethnically accurate and only represent white people. I’m sorry, but who cares? Why is this a thing? Thoughts? What if we took to twitter to get rid of Emoji’s? It’s a thought. BTW, I’m happy you’re still here to read this. I know there’s more time today for the world to end…but for now, thank you for spending your last moments reading BT!.